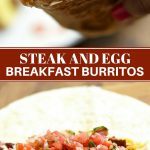 Steak and Egg Breakfast Burritos for the ultimate breakfast food! Loaded with grilled steak, fluffy eggs, fresh tomato salsa, and cheese, they’re hearty, tasty and a delicious way to start the day! We grilled carne asada for our 4th of July lunch last week and I made sure we had plenty of leftover meat to make burritos the next day for breakfast. 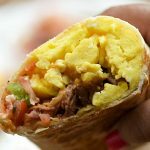 Steak and Egg breakfast burritos are my favorite menu item at Carl’s Jr and I used to drive thru every morning to get the meal combo on my way to work. Now that I am a full-time blogger and don’t really go out for fast food as often, I’ve resorted to making them at home. 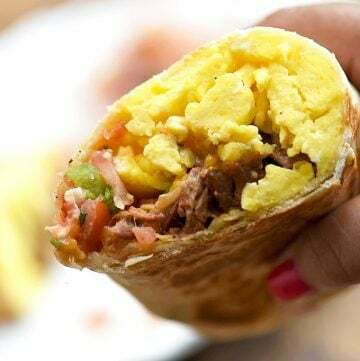 Picking up your breakfast burritos from a restaurant might be quicker and more convenient but homemade is so much better. No offense to Carl, their steak and egg burritos are the bomb, but they seem to get skinnier every year. Making them myself means I can pile as much meat, eggs, fresh salsa, and cheese as I like! 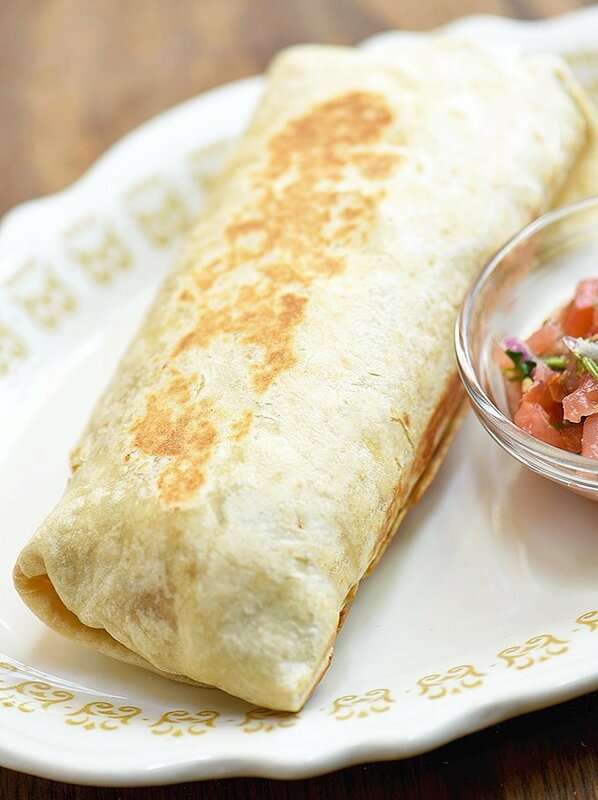 Great burritos start with the largest flour tortilla you can find. The ones I use are about 12-inches in diameter which are more than wide enough to wrap around and secure the filling. Briefly warm them on a hot pan or griddle until they’re pliable and easy to roll without breaking. It was a happenstance that we grilled carne asada during the holiday so I had well-seasoned meat with lots of smoky flavors. Normally, I usually just season the flap meat with salt and pepper and give it a good sear in a hot pan. You can also use sliced top sirloin or if you want to splurge and make your breakfast extra special, a juicy ribeye steak is a great option, too! The scrambled eggs are an important component; make sure they’re done moist and fluffy. Take them off the heat when set but still slightly wet as they’ll continue to cook in their residual heat. Let stand to warm before piling on the tortilla as the steam might make the burritos soggy. You can use bottled salsa if you’re freezing the burritos for future meals but I highly suggest taking the extra step of making pico de gallo if you’re enjoying them the same day. The fresh flavors of the tomato salsa really do make a difference! Cheddar cheese is what the recipe calls for but feel free to swap your favorite shredded cheese blend. 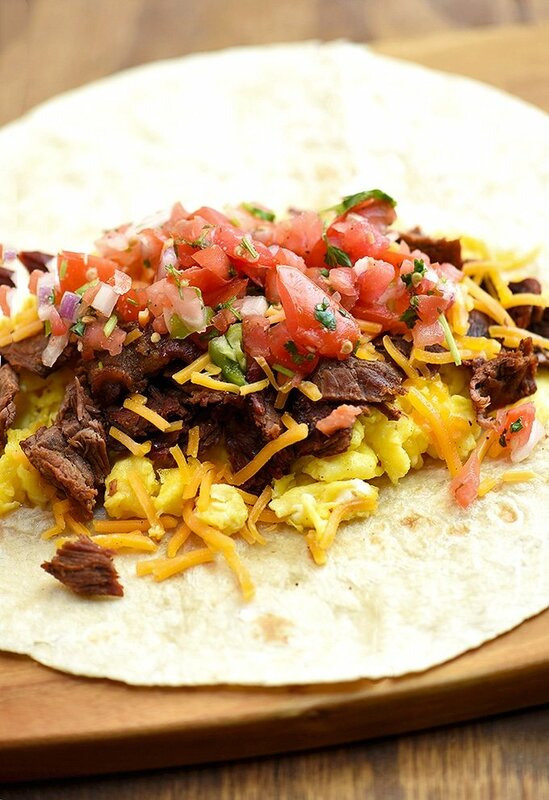 Make a batch of these steak and egg burritos this weekend! 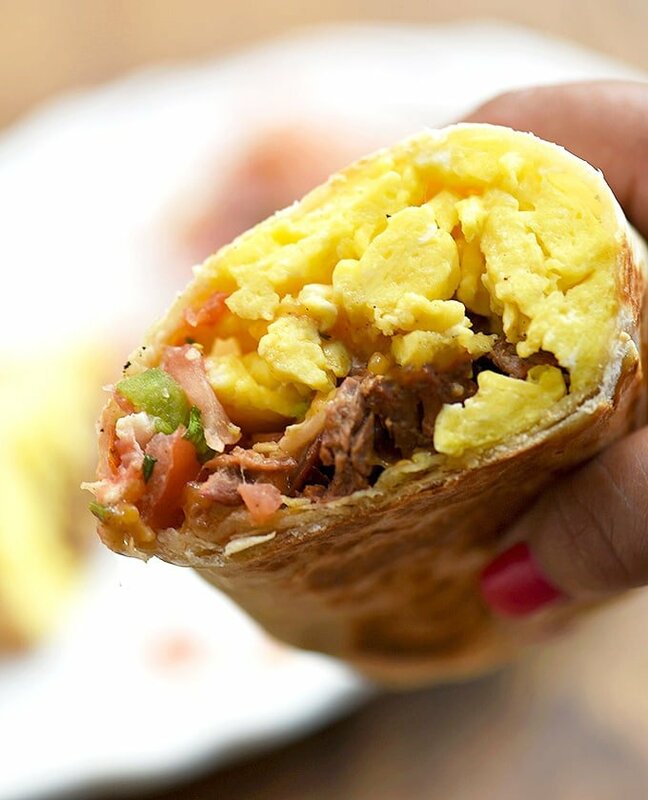 They’re hearty, tasty and perfect for on-the-go breakfast. They can also be made ahead and frozen for later use! As the fresh pico de gallo doesn’t hold up well when frozen and thawed, replace with bottled chunky salsa or assemble without salsa and spoon it in while eating the burritos. Individually wrap the prepared burritos in aluminum foil and place in resealable bags or airtight containers to freeze for up to 3 months. If freezing the burritos without wrapping, arrange in a single layer on a baking sheet and freeze for about 1 hour until firm and then transfer into resealable freezer bags. This way, they don’t stick together when frozen. To serve, unwrap foil and reheat burritos in the microwave for about 1 to 2 minutes or in 350 F oven for about 10 to 15 minutes or until completely warmed through. 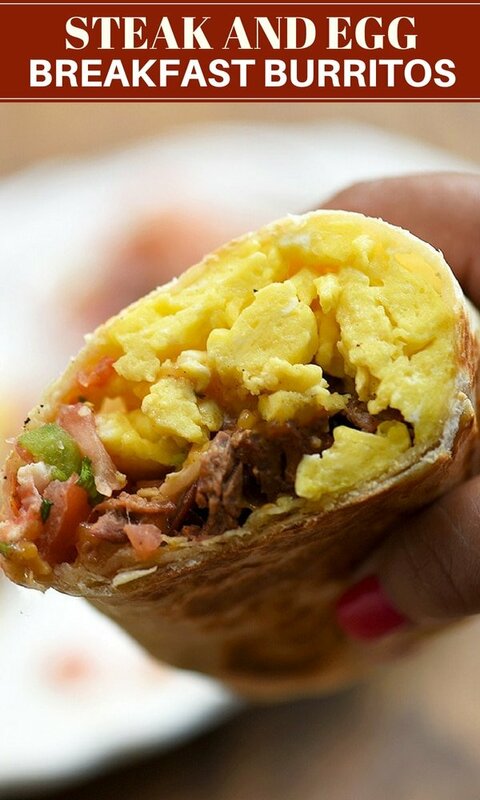 Steak and Egg Breakfast Burritos for the ultimate breakfast food! Loaded with grilled steak, fluffy eggs, fresh tomato salsa, and cheese, they're hearty, tasty and a delicious way to start the day! Season beef with salt and pepper to taste. In a wide heavy-bottomed pan over medium heat, add oil and swirl to cover the bottom of the pan. Heat until hot. Add flap steak in a single layer and cook for about 3 to 4 minutes. Turn and cook for another 3 to 4 minutes or until medium done. Remove from pan and keep warm. In a bowl, combine eggs and milk. Whisk until well-blended with no streaks of the white. Season with salt and pepper to taste. In a nonstick skillet over low to medium-low heat, melt butter and swirl around to coat bottom of the pan. When butter is barely bubbling, add beaten eggs and allow to cook for about 20 to 30 seconds or just until they start to set. Using a spatula, swipe around the edges of the pan to create large soft curds. Don’t flip the curds over. Continue to gently push and fold the eggs to form curds for about 2 to 3 minutes or just until they're set and still slightly wet. Remove from heat immediately and let stand to warm. With a knife, chop the flap steak. In a large ungreased nonstick skillet over medium-low heat, warm flour tortilla, turning as needed, for about 20 to 30 seconds or until soft and pliable. Place warm tortilla in a flat, clean surface. Spoon scrambled eggs and spread horizontally in the middle of the tortilla. Place steak on top of eggs. Spoon pico de gallo on top of the steak. Pull the bottom half of the burrito over to meet the top half and then pull the filling back to form a roll. Fold both sides in and roll the burrito into a tight log. Transfer to a platter with seam side down and repeat the process with the remaining filling and tortilla. In a wide ungreased nonstick skillet over medium heat, place burritos with seam side down. Heat for about 1 to 2 minutes and turn to another side. Continue to heat for another 1 to 2 minutes or until tortilla is lightly browned and slightly crisp. Remove from pan and cut each burrito into halves. Serve hot. In a bowl, combine tomatoes, onions, jalapenos, cilantro, and lime juice. Season with salt to taste. Stir to combine. Nutritional info calculated at 1/2 burrito per serving.